Here's a bite of cake...make sure you open WIDE!!! Funny Memaw and Clayton pic! Clayton giving Memaw a "kiss"
The 2nd part of the Clayton "kiss!" Clayton and Big Clayton riding on the 4-wheeler. She loves riding on it. She hits the top part and says "go, go" when she wants to go faster. Clayton swinging on her new swing set! Big Clayton sliding down her new slide after he waxed it for her. Clayton sliding down her slide on her new playground! Clayton hanging out in her new playhouse that Big Clayton gave her as an early Christmas present! Before we went on our annual Christmas outing with the Griggs family, Clayton thought she would try a new move...she dumped some "cerie" (cereal) as she calls it...on the floor. She had been picking it up...until she decided that it was more fun to climb under the bistro table and all of a sudden we hear "hep, hep! I tuck, I tuck!" So funny! Clayton out in the front yard...just hangin out! Clayton's 1st time on a carousel...she picked the giraffe! Mark letting everyone know how fast the carousel was...it definitely made Starla and Mark sick! Clayton "driving" through the Prairie Lights on our Christmas night with the Griggs fam. 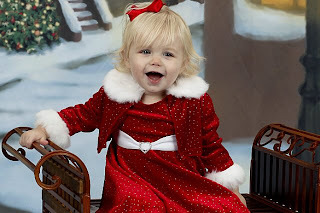 She and Keldan had just as much fun not being in their car seats in the car as they did actually looking at the lights. Clayton posing with a blow-up Dora at the "midway" stop in Prairie Lights. 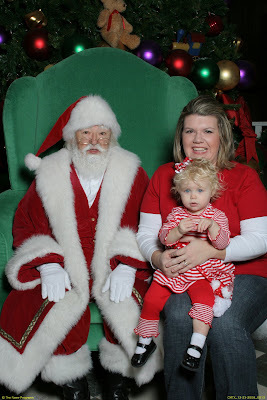 So, yesterday we went to Texarkana to see SANTA. We knew from the beginning that it would not be a pleasant experience...and we were prepared for that. We told the photographer that we would "sit" Clayton on Santa's lap, quickly get out of the way, and she needed to just take the picture!!! 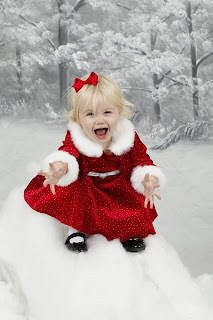 We told her that taking a time to get her "adjusted" and become "friends" with Santa would NOT work...so just take the picture because she would cry and it would not be pretty...but we were okay with that! 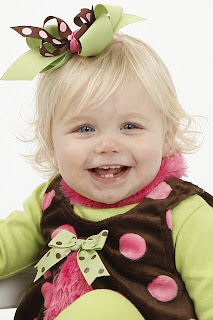 I really love this one...she looks so stinkin grown up! 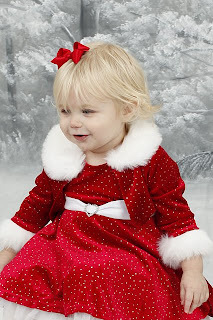 Okay, I loved this outfit but had NO idea that Clayton wouldn't be able to sit with her legs together when she was getting her pics taken! These are her Christmas Build-a Bears, but they are actually moose! 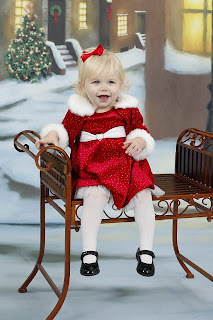 These pictures I love...even though Mark calls it her "Grinch" outfit! 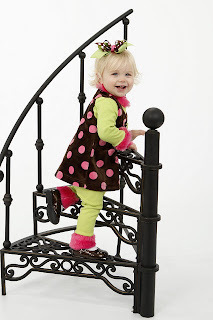 She had a blast climbing on this step! She would not put her feet on the bottom step...no matter how hard we tried! So, the last twenty four hours, I have been trying to do a little Christmas shopping so that I am not totally stressed out next weekend when school is out. We did a little Christmas shopping after church this morning...can't say that is was extremely successful, but every present is a small victory! Clayton is finished...but we've been buying stuff for her along the way since her birthday. We've gotten my dad's gift and Mark's mom's gift...and Keldan's birthday gift...AND...that's about it! I decided to have a wild idea last night. Clayton is with my parents until Tuesday because Chay's kiddos have croup and she can't watch Clayton tomorrow...so I thought, we should "make" stuff for our neighbors! Since I am only working part time, we decided that we really couldn't afford the normal $40 gift cards to various places that we usually do...so I decided that we (Mark and I) were going to bake stuff! Here's what we made: Peppermint Fudge, Peppermint Brittle, Cake Balls, Melt Away Cookies, and some awesome "white trash" that you make with peanut butter captain crunch...after about 2.5 hours in the kitchen we are through and the kitchen is clean...thanks to my wonderful husband! Here are the recipes if you are interested?!?! In a sauce pan, melt white chocolate chips on medium heat. Add frosting and continue to stir. Take off heat and add peppermint extract. Stir it well. Put it in 8 x 8 baking dish. Then, put one drop of food coloring in each corner of the pan and swirl it with a butter knife. Finally, sprinkle with crushed up candy canes and refrigerate until firm. Cut into little squares and serve! Put sugar and corn syrup in microwave safe bowl for 3-4 minutes. Stir and put back in microwave for another 3-5 minutes (until light brown...the original recipe says 4-5 minutes both times, but I am here to tell ya...you will end up with scortched brittle if you do that!!!) Stir and add vanilla and butter and stir...then microwave for another 1-2 minutes. Gentle stir in baking soda and then pour onto greased baking sheet. Sprinkle with crushed candy canes and use a spatula to "press down" a little. Let cool...chop it up and enjoy. Prepare the cake mix according to box. Cook it in whatever kind of pan you want. When the cake is done, crumble it (while kind of warm?) in a large bowl. Use a melon baller or scoop of some sort to make the balls. You don't want to make them too big. Then put them in the freezer for about 30 minutes or so. Dip the balls in the chocolate using a toothpick and place them on waxed paper. After they have dried, you can drizzle the opposite color of chocolate on them...they look amazing and taste awesome! You can use any combo of cake mix and icing! Cream butter until light and fluffy; beat in salt, and both extracts. Gradually blend in confectioners' sugar and then flour. Chill for about 1 hour. Shape dough into rolls about 3/4 inch in diameter, then cut in 3/4 inch lengths. Place ends up, on ungreased cookie sheet; press lightly with the bottom of glass covered with a damp cloth. Add colored sprinkles if you want. Bake at 400 for 10 minutes. Put all of these ingredients except the bark in a big bowl. Melt the white chocolate bark in the microwave and pour over all of the dry ingredients. Then lay it all out on wax paper. You can either put it in a long "clump" or do it my the spoonful. After it "sets" you can break it up into bite size pieces and serve it in a fun Christmas container. What kinds of fun things to you bake for Christmas?!?! Anyone?!? I am a part-time elementary music teacher for Birdville ISD. I only work on Mondays and Wednesdays...and a couple of hours on Friday mornings...then my REAL job starts...MOMMY!!! My husband, Mark, is a coach with Arlington ISD, and we have been married for almost 7 years. In August 2007, Clayton Grace joined us, and it has been the most incredible addition that we could have ever imagined. We also have a 100lb Golden Retriever, Otis. And that is our happy family! Trades of Hope Five Years In! Getting back in the game...again? Happy 85th Birthday to Pa!! What a morning! What a month! Introducing Disney's new star - MiMi Turner!! Today Was A Great Day! !